Mitsubishi Heavy Industries (MHI) has delivered two replacement steam generators for the third unit of Southern California Edison's (SCE's) San Onofre Nuclear Generating Station (SONGS). 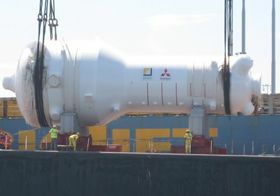 MHI said that the replacement steam generators delivered for SONGS 3 are among the world's largest, each measuring approximately 20 metres in length, seven metres in diameter and weighing some 580 tonnes. Each of them contains about 10,000 heat transfer tubes. Steam generators are crucial components of plants based on pressurized water reactors (PWRs), transferring the thermal energy generated in the reactor vessel from the primary coolant circuit to a scondary steam circuit that drives the turbine generator. MHI said it received the order from SCE in September 2004 after winning an international bidding competition. The steam generators were manufactured at the company's Kobe Shipyard & Machinery Works in Japan and will replace existing units at SONGS 3 during its next refuelling and maintenance outage, scheduled for the third quarter of this year. There are two pressurised water reactors at the SONGS plant, the 1070 MWe unit 2 and 1100 MWe unit 3, which entered service in 1983 and 1984, respectively. Replacement of the original steam generators will enable the plant to continue operating up to 2022. In February 2009, MHI delivered two similar replacement steam generators for SONGS 2, which were installed later that year. The delivery of the four steam generators to the SONGS plant brings the total number of such jobs by MHI for US customers to six. Since 1970, MHI has supplied steam generators to all of Japan's PWRs as well as to numerous PWRs in other countries, including replacement steam generators which the company notes help to extend plant operating life as well as boosting safety and efficiency. It is Japan's only steam generator manufacturer. The company has received overseas orders for 31 units, mainly from North America and Europe. The total reaches 125 units if steam generators and replacement units for the Japanese market are included.